A major ransomware attack targeting Microsoft Windows systems is affecting large and small companies and systems alike, many of them critical, on a global scale. The ransomware has been dubbed “Petya.” It is exploiting a vulnerability in Microsoft Office when handling RTF documents (CVE-2017-0199). It also exploits a vulnerability in SMBv1 which is the Microsoft file-sharing protocol. This second vulnerability has been dubbed Eternal blue and is described in Microsoft security bulletin MS17-010. 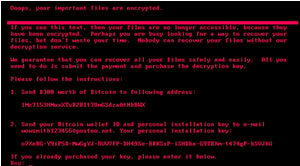 The ransomware has affected a large number of individuals, companies, organisations and government entities on an global scale. Behavioural analysis has been provided in the Youtube video below. If you have not already done so already, immediately install the MS17-010 patch from Microsoft. If you currently run an unpatched Windows system, you may not have time to patch it before you are infected. Consider shutting down your machine, if feasible, and leaving it off the network until there is consensus in the security research community on what this exploits and how to protect against it. Update your anti-virus definitions and run a scan on your system. You can find out which anti-virus products are detecting the current variant of Petya on this VirusTotal page. I’ve linked to one of the files involved in the infection. The page shows which AV vendors are currently detecting this file. NB: The green check marks mean the file is NOT detected by that AV vendor (it’s counter intuitive). Please note that currently Windows Defender is not detecting this Ransomware.